← Ph.D. – year 1. Yes, I have been cycling to University for the last 2 weeks. You might have seen the last post I made when I bought a cycle here in Singapore. Someone stole that cycle soon after I bought that. I was not using that cycle much anyways and it was not my first experience in loosing a cylce. Anyhow, I bought a new one a couple of weeks back and the new cycle costs three times of that of the first one. Shimano gear system, shock absorbers and the wide handle accounts to the extra money. I also changed the seat to a ladies seat to have a good cushy seat. Seat in boys’ cycles here are so hard and small. Why do they think that only ladies’ bums need to be cared. 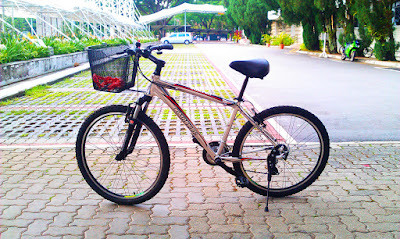 Now, that I shifted my apartment, cycling is the best way to reach University. It takes me around 15-20 minutes to reach my lab in the cycle. Earlier it used to take a minimum of 20 minutes to reach the lab in bus (with all the walking and waiting for the bus). Also, I know the streets around the University better now. Cycling always make you explore the shortcuts. Awesome! Just make sure no one/nothing hits on your cycle! Uh what!!! Thats your cycle!! First of all, it is a shade of pink. Second of all, it has the trademark ‘barbie carrier’. Third, you mention the seats being changed. Why didnt you go get yourself a ladies bike straightaway?? 1. The shade is red not pink!! :P.
2. It is Singaporean i guess, most cycles here have that carrier. See, it is convenient and since it is not considered girlie here, why shouldn’t I have one. 3. The comfort provided by the seat is way more than the embarrassment of having such a seat in the cycle.